The Second Half...: Just Move the Garbage Can! This simply contains the musings and adventures of an amazed 60-year-old who is making every attempt to enjoy life...the second time around. Just Move the Garbage Can! I'm beginning a new tradition as we head out of 2017. I'm calling it "First Morning." I have always felt like "party pooper" was tattooed across my bald forehead when I didn't want to stay up until midnight on New Year's Eve. No longer. Steve 2.0 is free to adjust how things are done! For instance, at school for nearly twenty years, I have been going into the JH Boys' Restroom and picking up the paper towels from the floor, tossed there by well-meaning 7th and 8th grade fellows who think their basketball skills are stronger than they really are. I then put them in the trash can where they belong, and wonder why the kids can't just make the shot! Finally late this Fall, after picking up soggy, germ ridden paper towels for nearly twenty years, I thought, "Hey dummy, move the garbage can!" Move the garbage can? How ridiculous is that? When I joined the staff at my school, the garbage can in the boys' bathroom was in the corner of the room, not at all close to the sink or the paper towel dispenser. I left it there. What a novel thought! MOVE THE GARBAGE CAN! Surely it can't be that simple, can it? Well, guess what? I no longer pick up those soggy, germ ridden paper towels! What a simple solution that was completely obvious for the nearly two decades I have been at my school, and I didn't even notice it! Honestly, I feel like a bit of a fool for picking up germy paper towels for nearly two decades! How many simple solutions to annoying problems are right in front of us? Having come through what I have in the last year, I see many things in different ways, but I am still discovering how set I am in some of my routines! I want to see things in different ways, and change if there is a better way! For instance, why do I keep trying to stay up late on New Year's Eve, when I don't enjoy it? I like to go to bed early and get up early! I prefer a nice, slow early morning over a groggy late night anytime! For sixty years, I have stayed up late (not so sure about my first few years of life) and felt groggy and lazy in the morning. I always end up sleeping too late, and missing out on the mornings that I love! No more of that! 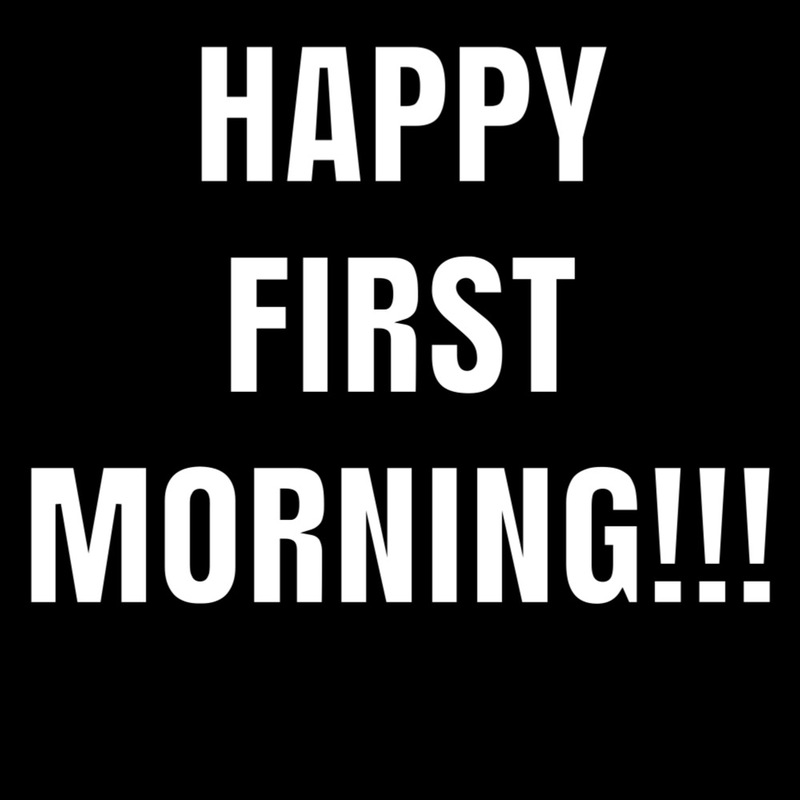 For me, there's a new celebration, and I am calling it "First Morning!" I am going to go to bed at a reasonable time, and get up early and celebrate the first precious morning of the year! That is much more my style, and those who want to stay up late and party, feel free! If you want to go to bed at a reasonable time and celebrate "First Morning" with me, reply and let me know! Let's start something new! I am Steven 2.0. I am a balding 59 year old Steven.I don't mind being 59 years old, because I have recently been given a second chance at life and I am in awe of that. People younger than me may think that is somewhat strange, but I am content and happy. In fact, I rather like my 50's. My 30's were nice. I wouldn't go back to my 20's for anything. I loved my 40's. I am now more than halfway through my 50's!!! I had more adventures in my 40's than I ever did in my earlier seasons. Some things you may or may not want to know...My wife and children are unique and wonderful human beings. I love them dearly. I have a great life. The older I get the more I realize that I'm weary of cultural Christianity; but, I love the vital life that comes from seeking Truth. I have had the immense privilege of traveling to many parts of the world, enjoying the people of many nations and doing what I can to make the world a better place in some small ways.